We're committed to cultivating global, happy citizens who know who they are, understand their gifts and approach life with wonder, joy, humility, and a profound desire to share. 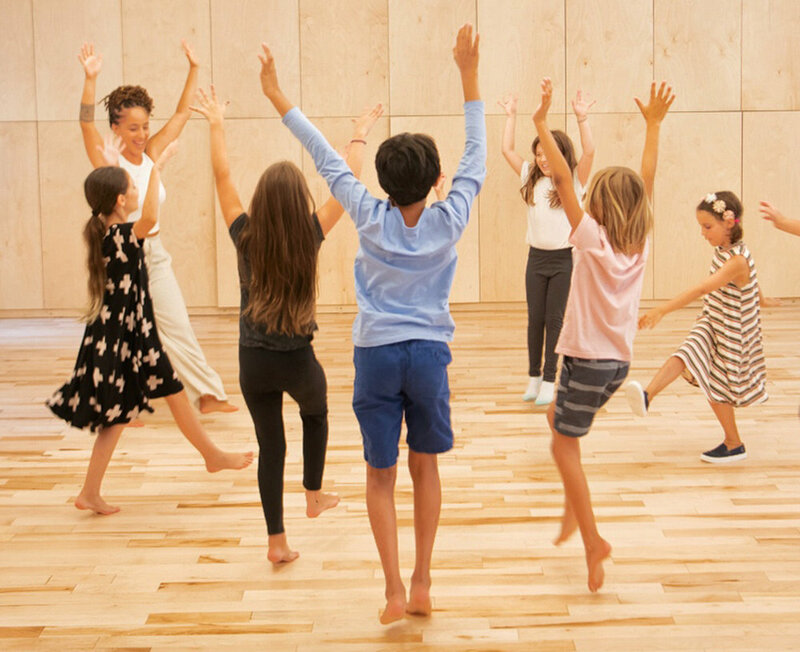 Our practice is focused on supporting the growth of children's minds, bodies and souls through an integrated, differentiated curriculum rooted in the Montessori tradition. By placing equal emphasis on all 6 Pillars of Growth, children can continue to grow as balanced, realized, happy humans. Students spend time each morning in a Montessori-based Grow Cycle engaging in a process of self-construction through independent and collaborative interaction with materials, exploring subjects such as math, science, social studies and language arts (English, Hebrew and Mandarin). Students will learn about the interconnectivity of the universe. This is a cosmic education! Students will learn how to respect and engage their body as a tool to increasing wellness and happiness. Children will experience various physical practices such as yoga, dance, athletics and martial arts. Additionally, our students will learn to cook and eat consciously. Drawing from wisdom cultures around the world, as well as our daily We Practice, students nurture their connection with the planet and all living things. Our practice consists of morning yoga asana, pranayama, meditation, intention setting, lunchtime mindful eating and an end of day gratitude circle. 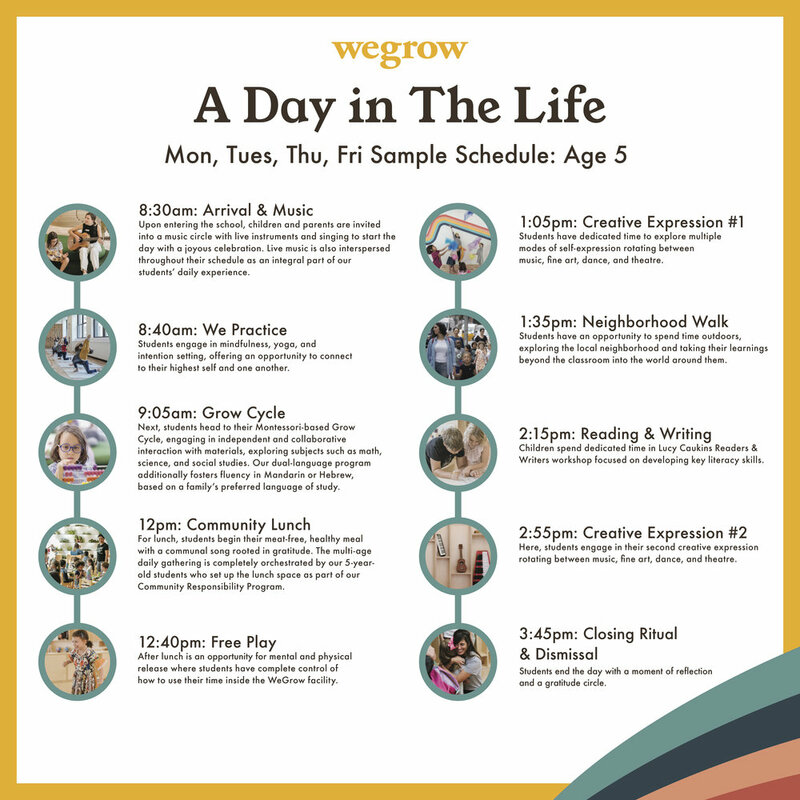 Our Conscious Creators program consists of master classes with leading creators in their respective fields, one-on-one mentorships with WeWork employees and members, a student-run farm stand and our Community Responsibility Program (CRP) wherein students take a meaningful part in running WeGrow. 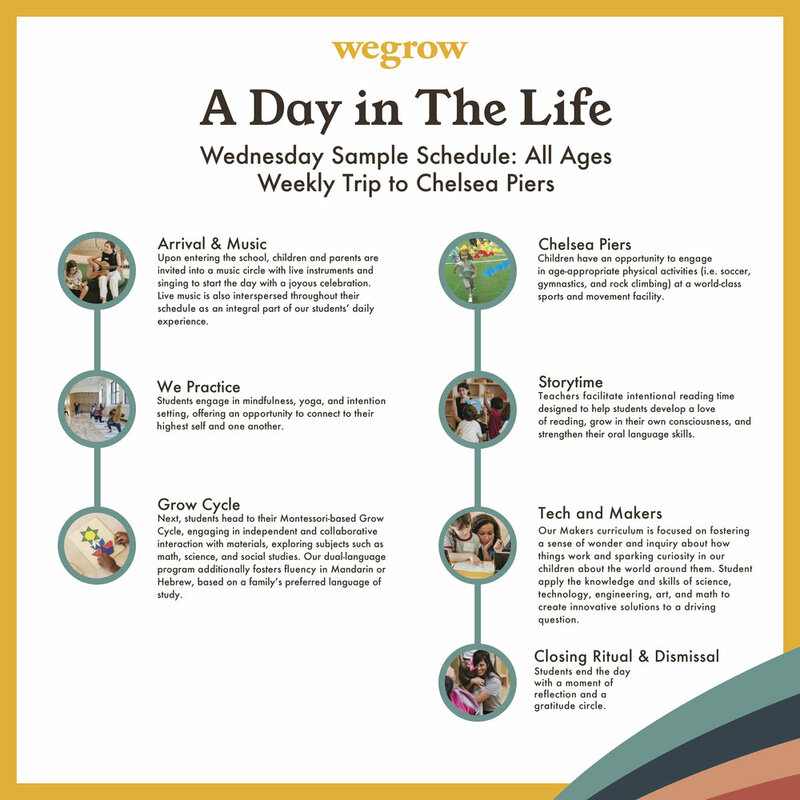 Creative Expression is heavily emphasized at WeGrow and viewed as core curriculum. Students will engage in two creative classes per day alternating between Music, Drama, Dance and Fine Arts. Additionally, live music will be interspersed throughout their schedule becoming an integral part of our students' daily experience. Students travel on a weekly basis (weather permitting) to a full day nature immersive for hands-on learning—and to help each child develop a deep connection with the planet. 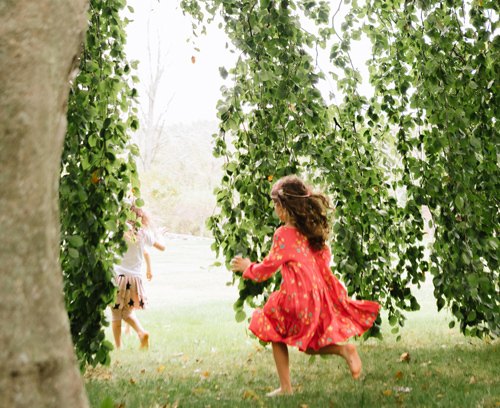 Our New York school includes weekly trips to a 100-acre nature preserve and farm. 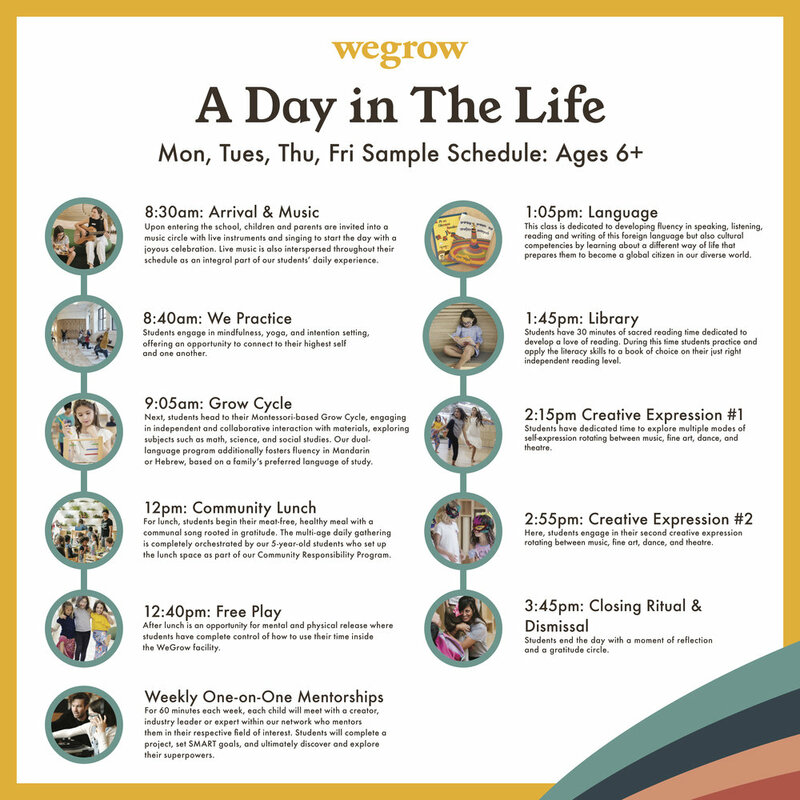 WeGrow presents students with the opportunity to choose a language path, while also exploring the universal life principles that are taught through several of the world's wisdom cultures. 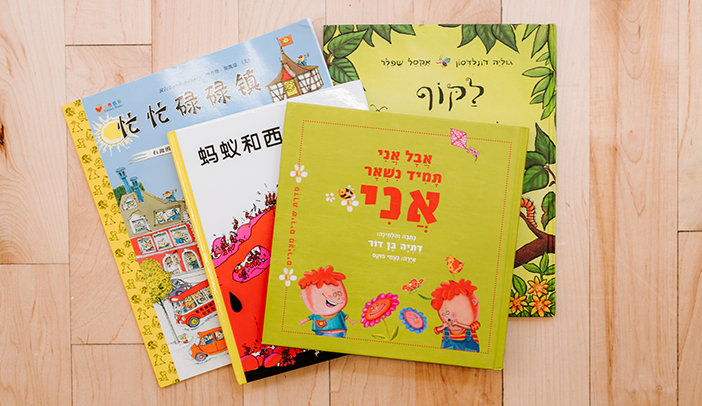 For the 2019-2020 school year, we are excited to offer a Hebrew path that will incorporate Judaic studies and provide modern Hebrew language immersion in the early childhood classrooms (ages 2-4) and dual-language instruction in the elementary classrooms (ages 5+). For our English paths, students will gain written and verbal fluency in their choice of either Mandarin or Spanish. We also incorporate the study of Eastern wisdom traditions in these classrooms based in Tibetan Buddhism and Taoism. Each path will be one neighborhood in a WeGrow village that embodies many beautiful languages and cultures, and all students will have moments in their day to study and practice Yoga, Ayurveda, and Secular Ethics. Within our school experience, we support our students' journeys to connect deeply to their roots and use the wisdom and spirituality from their ancestors to best serve the larger We. We welcome children and families from all backgrounds to enroll in the path of their preference. As much as learning a language can open doors to different cultures around the world, technology can help our global citizens create a better, more connected one. This aspect of our core curriculum allows students to understand the powerful relationship between art and science. Through a focus on robotics, coding and engineering, our students realize how to apply what they learn to solve real-world problems by engaging in a process of inquiry and discovery through exploratory projects that teach 21st century skills. Engaging in this subject matter early and holistically can unlock our students’ potential to use their superpowers to serve others. Now you can. Sign up to learn more soon.